Wind Power is one of the fastest growing of the alternative energy sectors and making your own wind turbine rotor blades is not as complicated as you may think. But before you start cutting up pieces of wood, plastic or metal, make sure that the design speed of your rotor blades will be correct for the operating speed of your wind turbine generator. Wind turbine rotor blades are the most highly stressed and vital component of any wind turbine. Their job is to absorb the kinetic power of the wind and convert this energy into a rotary motion around a central hub. While the central hub of the blades may be rotating at a gently speed relative to the wind, the tips of the blades are rotating much faster and the longer the blade is, the faster the tip rotates especially for propeller type blade designs. When dealing with wind turbines and wind turbine rotor blade designs, the term “tip-speed ratio” (TSR) is often used instead of blade rpm. 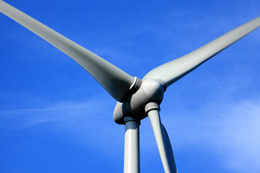 Wind turbine rotor blades can potentially rotate at very high speeds. The tip-speed ratio is the speed of the rotors tip as it rotates around its circular path divided by windspeed. So for a given windspeed, the higher the TSR the faster it rotates. Gyroscopic forces are the worst threat to the blades of small wind turbine as their rotational movement causes them to alternately flap the blades back and forth once per revolution as they pass the support column and unless the rotor blades are firmly secured this movement may even fly off. If a blade breaks due to a poor design or construction, and this has been known to happen, it could fly some distance through the air causing serious damage and injury to anything it hits. 1. Build the Rotor Blades Yourself – This is the least expensive option but takes a lot of time and careful work as each blade must be of the same shape, design and balanced. 2. Buy Pre-made Rotor Blades – Buying off the shelf turbine rotor blades costs more but is a lot less work as the design, testing and balancing has been done for you. One of the big advantages of buying your rotor blades is that there are hundreds of commercially made rotor blades available on the market with the most common being the propeller type design. Manufacturers now make blades from several different types of materials from aluminium, to plastics, to wood. Although wood was once commonly used to make blades for small wind turbines there are less companies that manufacture blades exclusively from wood. It’s just too expensive and time consuming but they are still available for aeroplane propellers. Nowadays wind turbine rotor blades are professionally made and are typically constructed from extremely durable and relatively inexpensive synthetic materials, various types of PVC plastics or composites to give the best blade shape. Of course there are also disadvantages to buying windmill blades instead of making them yourself with the biggest being cost and inflexibility in design as PVC wind turbine blades can not easily be modified. While there are many advantages to buying your wind turbine rotor blades, there are also some big advantages when it comes to building them yourself. The blades you make will match exactly your turbine generators size and design. You can design and shape your blades to fit your wind speed area making them from a variety of different materials. Wood is the most common DIY rotor blade material as it is easily available, and easy to cut and shape using simple hand tools. But the biggest advantage of making your own wind turbine rotor blades is the satisfaction of doing so and that you have saved some money. However in reality, by the time you have finish making, painting and balancing your home made wind turbine blades, the actual cost can be very close to equal if not more than that of pre-made commercial blades. So there are advantages and disadvantages of making your own wind turbine rotor blades or just buying them. If you decide to build your own blades, take the time to learn about how to do it easily and cheaply using recycled materials and be sure to take the time to design your rotor blades to give you the best blade shape for your own particular application. Taking the time to learn beforehand will ensure your wind turbine operates trouble free for years to come and giving you the satisfaction of telling everyone that you did it. To learn more about “Wind Turbine Rotor Blades”, or obtain more wind energy facts about the various wind turbine designs available, or to explore the advantages and disadvantages of wind energy, then Click Here to get your copy from Amazon of one of the top “Wind Turbine Guides” today. Hello, new to wind energy and very excited. I’ve built a wind turbine from an old treadmill motor. I have two more in the works from a car alternator and another old motor. My question is how can one tell or calculate how many watts the turbine will output? I plan on charging a bank of batteries with these but need a little info on how to calculate the watts my system can put out. Any hints? I have a small question about windturbines. Turbines of the same park usually turn in the same direction. Because the wind direction is the same for all turbines of the same park. And I guess there are some electronics onboard of these windturbines which let the blades turn into the direction of the wind. But there are some noticeable irregularities. Sometimes some of the turbines are not turning, or when they are, they are turning in another direction compared with most of the other turbines. I just wondered what could be the reason for this. It could be there is some kind of defect of the incentive electronics. But in that case there a lot of windmills that are dysfunctional, which seems unlikely.